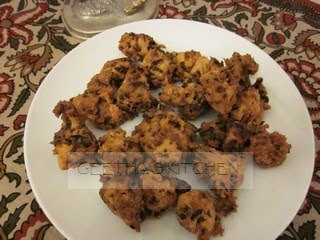 Pakoda are delicious crunchy veggie fritters often prepared for afternoon tea time; they also make fabulous appetizers or starters for parties. These are also known as "killu pakoda" (literally pinched pakoda) to differentiate them from the "ribbon pakoda" a crisp chip-like snack. A friend used to make pakodas at a moment's notice whenever I visited her in the afternoons as an after-school treat. They are quick to make and ever so much quicker to disappear! If you do end up with leftovers, not to worry - they may be eaten at room temperature or added to yogurt or tomato based sauces to make a wonderful curry. The following is a basic recipe for pakodas. Other chopped veggies such as bell peppers, cabbage, green beans, zucchini, etc. may be added; sometimes I use green onions instead of the regular. When you add extra veggies, you may have to adjust salt and the cayenne. Coarsely crushed peanuts may be used instead of the cashews. The nuts add a lovely rich dimension to the pakodas; your taste buds get a delicious surprise when you come upon the occasional nut hiding in them. Mix the flours, salt, asafetida, chili powder and the veggies in a large bowl. Add just enough water to make a stiff and crumbly dough; this is essential to get crispy, crunchy pakodas. If the dough is soft, the pakodas will be soft also. Heat the oil until very hot but not smoking; if the oil is too hot, the pakodas will brown too quickly and burn. Pinch off small teaspoonfuls of the dough and slip gently into the hot oil; don't roll the dough into smooth balls - the irregular jagged edges are what gives them crispness and character. Cook as many pakodas as will comfortably fit in the oil; crowding will produce uneven cooking and will take longer. Cook, turning until all sides are red gold; it should take about 4 or 5 minutes per batch. You may have to adjust the heat as required so that the pakodas cook through. Remove the pakoda from the oil with a slotted spoon and drain on paper towels. If the dough gets soft from the moisture in the veggies, just add a little more of the flours with seasonings and mix well. Serve hot with Green & Sweet Chutneys. Enjoy! !